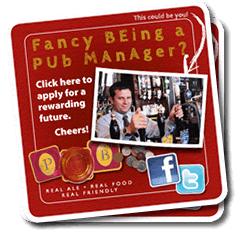 "Be a pub manager for a rewarding future"
Which of the following licensed premises have you had experience operating? Which area would you prefer to work? In which of the following commercial food areas do you have experience of? What was the average weekly WET sales at your last management post? What was the average weekly FOOD sales at your last management post? As a Pub People licensee you will receive support from a well resourced team, many of whom have successfully run their own pub businesses. Their aim will be to enable you and your pub to compete effectively in the local pub market and you will play a central role in bringing any plans to life. As the business grows then our team will be able to offer specific support on staff management, business delevopment, marketing, management controls and capital investment in what we would hope will be long term relationships.